Okazaki's works (paintings and reliefs) are exhibited in group exhibition "Parergon: Japanese Art of the 1980s and 1990s". 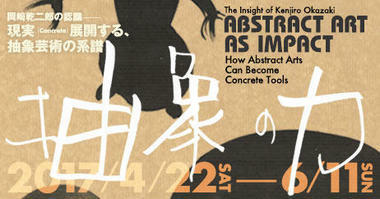 Okazaki's paintings are exhibited in group exhibition "Abstraction in Asia: from 1960 to nowadays". Okazaki's new paintings are exhibited in the Art Basel Miami Beach 2017.
innovative views on works based on a broad knowledge of culture and art. The intensity of these thrilling readings has often shaken up our minds. institutions, this exhibition will examine the primal intensions of Abstract Art. perception and works directly upon the mind. avant-garde is this concrete power of Abstract Art. the world have been greatly misunderstood. Japanese pavilion of the International Architecture Exhibition. with the choreographer Trisha Brown, premiered in early 2007. Hirshhorn Museum and Sculpture Garden (HMSG) in 2014. Library), featuring his analysis of Filippo Brunelleschi. and mentally or physically disabled people with one attendant. for groups of 20 or more. "Robots create Humans: The definition of robot through art, or the definition of human and art through robot"
Okazaki was in charge of production and choreography of the "DekNobo" robots, and costume design (concept, original sketch). Other pieces performed：Foray Forêt, How long does the subject linger on the edge of the volume.